Over the summer, we argued that the grocery business in the U. S. is, and always has been, a fairly miserable one. From A&P to Grand Union, Dahl’s, etc., bankruptcy courts have been littered with the industry’s failures for decades. The reason for the persistent failures is fairly simple…razor-thin operating margins that hover around 1-3% leave the entire industry completely incapable of absorbing even the slightest financial shock from things like increasing competition and food deflation. Meanwhile, if these retailers have difficultly absorbing even the slightest changes in competition and food inflation, you can only imagine how the efforts of Amazon to slash in-store employee headcounts, a line item which Kroger spends roughly 17% of their revenue on, might impact the fragile industry. Unfortunately, at least for the traditional grocers of the world, a completely automated shopping experience may be closer than they had hoped just a couple of years ago. This post was published at Gold Core on December 13, 2017. There is a general belief, and that is all it is, that state finances fare better in an inflationary environment than a deflationary one. This perception arises from the transfer of wealth from lenders to the state through a devaluation of the currency, which occurs with monetary inflation, compared with the transfer of wealth from the state to its creditors through deflation. The effect is undoubtedly true, even though it is played down by governments, but it ignores what happens to continuing government obligations and finances. This article looks at this aspect of government finances in the longer term, first on the route to eventual currency collapse which governments create for themselves by ensuring a continuing devaluation of their currencies, and then in a sound money environment with a positive outcome, for which there is good precedent. This is the second article exposing the fallacies of supposed advantages of inflation over deflation, the first being posted here. Inflationary policies While central bankers have convinced themselves, in defiance of normal human behaviour, that consumption is only stimulated by the prospect of higher prices, there can be little doubt that the unmentioned sub-text is the supposed benefits to borrowers in industry and for government itself. Furthermore, the purpose of gaining control over interest rates from free markets is to reduce the general level of interest rates paid to lenders, further robbing them of the benefits of making their capital available to willing borrowers. This post was published at GoldMoney on December 07, 2017. Following The Great Recession and The Fed’s extraordinary response, there was a lot of money available that we seeking risky assets, such as equities, housing and apartments. Venture capital, the darling of business schools (that rarely look at the data, but focus on the snake oil-aspect of VC), has been in decline since 2014 after a meteoric rise after 2007. This post was published at Wall Street Examiner by Anthony B Sanders – December 1, 2017. This year, (2017) was the year that the financial system moved from fearing deflation to expecting inflation. You can see this in the breakout in inflation expectations. From 2013 until mid-2016, the financial system’s expectations of future inflation were in a downtrend. Mid-2016 this changed as expectations began to rise, breaking this downtrend in early 2017. They’ve since continued to rally. Bouncing off support. This post was published at GoldSeek on 27 November 2017. Passive, trend following funds – which account for the bulk of daily flows across financial markets – have only helped exacerbate the situation. But what’s worse is market strategists’ refusal to acknowledge how these flows, which create destabilizing feedback loops, tend to drive trading. Instead, sell-side ‘experts’ employ flimsy fake narratives ex post to explain trading activity. These narratives are often accepted without question or criticism by financial reporters at CNBC, the Wall Street Journal, Bloomberg…the list goes on. This post was published at Zero Hedge on Nov 26, 2017. One of the obstacles to a successful employment policy is, paradoxically enough, that it is so comparatively easy quickly to reduce unemployment, or even almost to extinguish it, for the time being. There is always ready at hand a way of rapidly bringing large numbers of people back to the kind of employment they are used to, at no greater immediate cost than the printing and spending of a few extra millions. In countries with a disturbed monetary history this has long been known, but it has not made the remedy much more popular. In England the recent discovery of this drug has produced a somewhat intoxicating effect; and the present tendency to place exclusive reliance on its use is not without danger. Though monetary expansion can afford quick relief, it can produce a lasting cure only to a limited extent. Few people will deny that monetary policy can successfully counteract the deflationary spiral into which every minor decline of activity tends to degenerate. This does not mean, however, that it is desirable that we should normally strain the instrument of monetary expansion to create the maximum amount of employment which it can produce in the short run. The trouble with such a policy is that it would be almost certain to aggravate the more fundamental or structural causes of unemployment and leave us in the end in a position worse than that from which we started. This post was published at Ludwig von Mises Institute on 11/16/2017. There’s been very little deleveraging after the last financial crisis and, in fact, debt levels are at new records globally, which means investors should be thinking about the risk of ‘debtflation,’ Russell Napier, editor of The Solid Ground, told FS Insider last week (see Russell Napier on Debt Deflation: Too Much Debt, Not Enough Money for audio). It isn’t the case that we’ve seen much deleveraging since the financial crisis, Napier noted. Globally, the debt-to-GDP ratio is at an all-time high, he added, significantly above the levels seen in 2007. Though there has been some deleveraging in the household sector, Napier stated, this isn’t the whole picture. It ignores the releveraging of the government during the last crisis, and also that corporations have been adding significant amounts of debt. If we look globally, emerging markets are fueling the rise to a new high in the debt-to-GDP ratio. It isn’t just China either, but other countries as well that are responsible for this effect. ‘If the world was fragile in 2007 because there was too much debt and not enough GDP, it is significantly more fragile today,’ Napier said. Yellen was right to brush off ‘transitory’ factors of ‘low’ inflation. Consumer prices, as measured by CPI for October, rose 2.0% year-over-year. A month ago, CPI increased 2.2%. The Fed’s inflation target is 2%, but it doesn’t use CPI, or even ‘Core CPI’ – which excludes the volatile food and energy items. It uses ‘Core PCE,’ which usually runs lower than CPI, and if there were an accepted measure that shows even less inflation, it would use that. But it does look at CPI, and there was nothing in today’s data to stop the Fed from raising its target rate in December. This post was published at Wolf Street on Nov 15, 2017. A few weeks ago, we highlighted the apparent contradiction of the reflation trade that has unfolded in the Treasury market. In brief, that contradiction is the flattening yield curve. This week, we’re returning to the yield curve – the 2-10 spread specifically – and we will be discussing what it means if it is indeed a harbinger of slower economic growth. First, we must posit that the narrowing spread between the 2-yr note yield and the 10-yr note yield might not be the telltale economic indicator some pundits think it is. It could be, yet we can’t dismiss the possibility that it’s a byproduct of a desperate search for yield among foreign investors staring at such low rates at home. Before inflation, the yield on the 10-yr Japanese Government Bond is 0.02%; the yield on the 10-yr German bund is 0.38%, and the yield on the UK’s 10-yr gilt is 1.26%. The yield on the 10-yr Treasury note is 2.33%. This post was published at FinancialSense on 11/13/2017. A fixed amount of real estate and continuously increasing money supply, with ‘passing Go’ functioning as the game’s monetary printing press. The monopoly analogy is readily applied to the current real estate market. The Fed tossed roughly $2 trillion into the mortgage market, which in turn has fueled the greatest U. S. housing bubble in history. The most absurd example I saw last week is a 264 sq ft studio in Los Angeles listed on 10/26 for $550,000. The seller bought it a year ago for $335,000. This is the degree to which Fed money printing and easy access Government guaranteed mortgages have distorted the system. This post was published at Investment Research Dynamics on November 10, 2017. The US dollar weakened and gold rose on suspicion that Trump’s tax cut proposal could see modifications. The next seven days is filled with market moving US economic data releases. The answer which investors will be looking for is what next after the expected December interest rate hike by the Federal Reserve. I am looking into global inflation/deflation targets for next year. Energy price trend will play a key role in inflation direction next year. The big challenge is to judge the pace of rise of crude oil prices and not the actual rise. At the moment the bottom for crude oil looks at $42 and top at $86+ in the next twelve months. Developments in bitcoins and block chain technology are being closely watched. 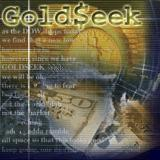 This post was published at GoldSeek on 10 November 2017. Fiat currencies have had nearly a 46 year run of success. But with cryptocurrencies ‘all the rage,’ what Deutsche Bank Strategists Jim Reid and Craig Nicol call ‘inherently unstable’ fiat currency system without any commodity backing might be coming to an end, they assert. The end of a demographic trend will usher in another inflationary period, Deutsche Bank asserts The idea of tying the supply of money to a commodity such as gold was that it kept government spending in check because money was in limited supply. The US abandoned the gold standard in 1971, anchoring the currency’s value, not to a commodity but rather the faith in a government. This was followed by a sharp rise in inflation resulting in mortgage rates rising to near 20% annually by 1981. The resulting debasement of currency value and loss of buying power might have ended the fiat monetary system if it were not for the deflationary period that came along in the 1980s. This gentle deflationary trend is about to come to an end, Reid and Nicol think. This post was published at FinancialSense on 11/06/2017. After three and half decades the global economy has now entered a three and half year period of slow rotational change which will likely be seen in future years as the “Great Reversal”. A decline in real interest rates (which have been a prime supporter of asset prices), A drop in real labor earnings in advanced economies, and, A meteoric rise in inequality within countries alongside a drop in inequality between them. This post was published at GoldSeek on 5 November 2017. After the Fed bailed Wall Street out of the 2008 financial crisis, and exploded its balance sheet through quantitative ease, many investors, including astute hedge fund managers, foresaw hyper-inflation and charged into gold as the most likely beneficiary. They solemnly quoted Milton Friedman, who said that inflation is driven by central bank-created money, and leaping Fed assets foretold lots more of it. But inflation didn’t gallop, but receded – and with it, gold prices. But that hasn’t dissuaded the inflation bulls. Wall Street Journal columnist James Mackintosh wrote in the recent September 8 edition: ‘The danger is that the low inflation consensus has grown far too strong, on too little evidence.’ A September 1 Journal headline sums up those folks’ problem: ‘Inflation Still Subdued, Posing a Conundrum.’ They point to the low U. S. unemployment rate, the weak dollar, and stronger growth worldwide, which, they maintain, should intensify demand for commodities and push their prices up. 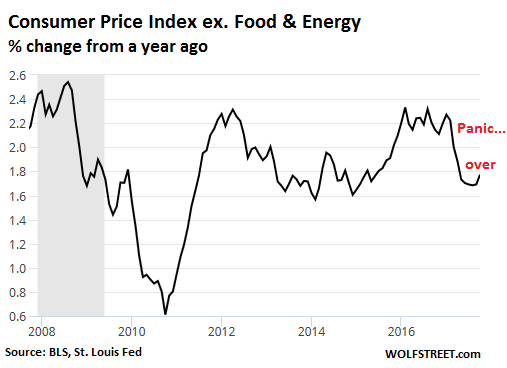 Yet the personal consumption deflator, the Fed’s favorite inflation measure, ex food and energy has been slowing since late last year. This post was published at FinancialSense on 10/31/2017.